Just when we thought we were tired of watching people do the running man challenge, these newlyweds nailed it at their wedding and made us love it all over again. Just when we thought we were over the running man challenge, these newlyweds came along and changed our minds. 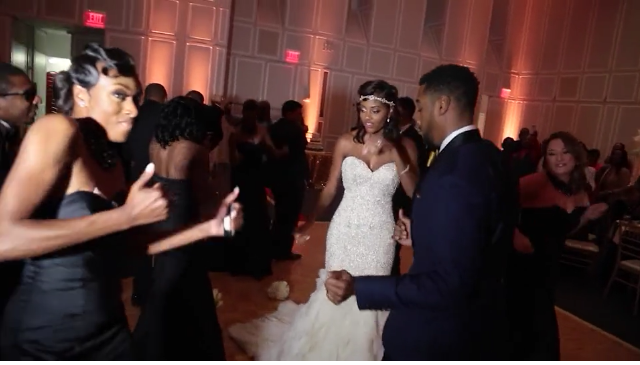 Meet Danielle and Adam, who recently tied the knot and decided to surprise their guests and break out into their rendition of the “running man dance challenge” during their first dance (with a little help from their bridal party). The bridesmaids and groomsmen got in on the fun too, and the moment was one to remember. One things for sure, for today’s modern brides and grooms, creating a wonderful wedding celebration is second only to the act of becoming husband and wife, and these two just made their first dance all the more unforgettable. Wedding videographer Chip Dizard captured the fun moment and shared it on his blog and Instagram. We love to see brides and groom make their wedding day their own, so kudos to the happy couple and congrats on a (clearly) fabulous big day.